Recently, a friend and I visited our small, local art museum (Allentown Art Museum). The permanent collection there has a few real highlights, which for me include the Frank Lloyd Wright-designed library from the Francis Little House and a limited but fine collection of glass and ceramic decorative arts. Like many smaller US museums, the Allentown Art Museum hosts traveling exhibits that can be eye-opening (last year’s exhibit of Lautrec’s works on paper, currently at Washington Pavilion in Sioux Falls, SD, was one of these). Currently, Allentown’s museum is featuring work by two artists who employ very different methods, and their styles are so different that it seems silly to compare them: Matthew Daub and Paul Harryn. Both of them live in the region, however, and both might be considered painters of place. The near-monochrome, panoramic watercolors of Matthew Daub’s Maiden Creek series also appealed to me because of place, specific–definite–“realistic” place, if not as obviously spirit of place. This is because I know the roads and streams he depicts very well, have traveled them often; but I have seldom considered them “beautiful” enough for plein air views or photographic compositions (without omitting, say, road signage, utilitarian concrete bridges, highway off-ramps, minivans, and the like). Daub portrays those items in his photorealistic paintings. What I found revelatory in these works is how genuinely beautiful those familiar roads are when the view or frame changes. The thin horizontal rectangle of Daub’s place-paintings accentuates parts of the composition such as bare tree branches, shadows on the curved roads, the rough texture of municipal concrete next to embankments. 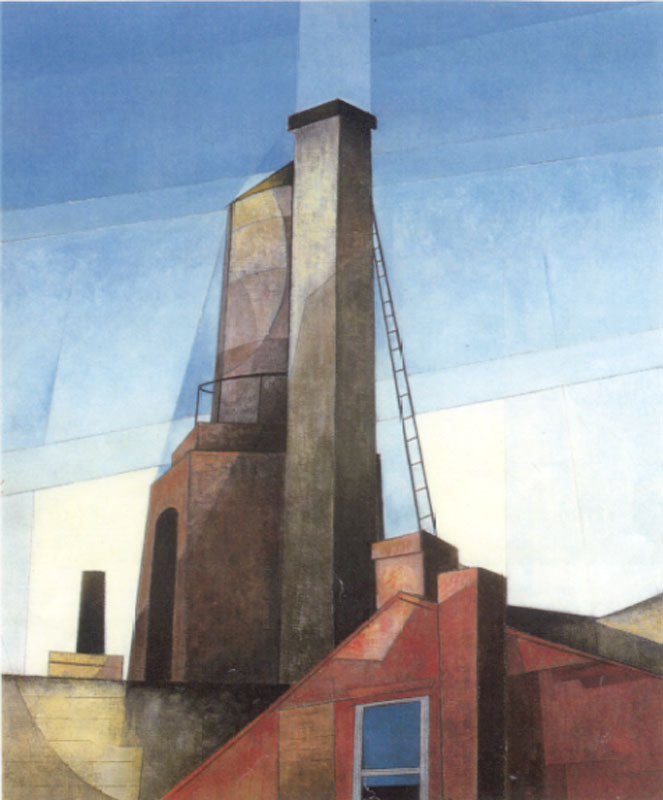 Daub’s choice of subject matter reminds me a bit of the later paintings of Charles Demuth, but Daub’s paintings include more of the natural environment surrounding the silos, stairs, and industrial objects. Next time I am driving Route 143 near Kempton, I will appreciate the scenery more for having acquired, through Daub, a new perspective on the dull, drab, too-familiar landscape. The aesthetics of road-building, New Jersey barriers, highway ramps, creekside roads, and galvanized silos blend surprisingly well with the brushy trees, gentle hills, and stone barns of Berks County. I’ll close with a poem by Maggie Anderson, from her now, alas, out-of-print book Cold Comfort (1986). Daub’s paintings made me think of this one, though the river is different. a hard-working undergraduate who barely passes. of the jobless in the gray afternoons. below me, a city rebuilt three times after floods. an enormity none of us can fathom, though we try. Tonight, I will be reading at one of my favorite places: A public library. With one of my favorite fellow-writers, April Lindner.